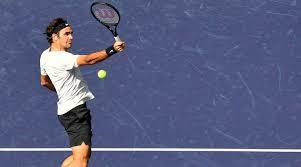 Roger Federer defeated the 25th seed Filip Krajinovic 6-2, 6-1 in pursuit of a record sixth BNP Paribas Open title on Monday. Roger Federer rolled past No. 25 seed Filip Krajinovic 6-2, 6-1 in pursuit of a record sixth BNP Paribas Open title on Monday, while Sloane Stephens remained mired in her post-US Open slump. Federer improved to 65-5 since returning from a left knee injury last year with his third-round victory in a rare day match. The Swiss star’s young son, Lenny, watched from a box wearing a Superman cap.